This was the only YES concert I attended. I happened to be owed several hours of overtime (I was a State Trooper assigned in the area) and had the great fortune to be paid to hear my favorite band. I too was surprised at the empty seats, as most bands fill the venue. It was a great show. This was an unusual show to say the least. I had seen the Montreal show and for some reason this show was advertised on the radio here in Ottawa. I got pretty excited about it and just had to go so I personally bought 3 tickets and worried about who would want to go later--ended up bringing my girlfriend and two soon to be Yes converts who were only familiar with YesWest. The drive down was beautiful and Lake Placid brought to mind "mountains come out of the sky and they stand there". 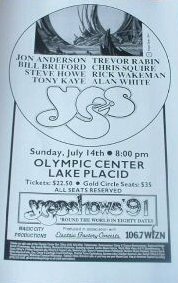 I remember that I had had a dream a week or so earlier about a Yes concert but there were only a few people there and I was upset by the turnout. Well, this show was the smallest crowd I have (still) ever seen at a YESSHOW. I was almost embarassed for them and wondered if the band would be upset or troubled by it. There were maybe 2000 people there (including a few busloads of very young people , about 10 yrs old , who were freaking out and danced the whole show prompting Jon to tell them they were crazy). I had Gold Cirlce seats placing us a few rows from the stage and with no one behind us I spent the whole show standing on my chair and got a few nods from the boys. When they came on stage they plowed ahead with a very proffesional show but I swear they were shocked by the size of the crowd. CTTE was a little off but since I knew they had not played this anywhere else on the tour and they dropped the annoying solos I was thrilled and my newbie guests were BLOWN AWAY by the tune. They recorded the show or parts of it but I have no idea if it has ever been used. Awaken was just the best on this tour (best ever really), Wakemen spent a long time yelling under the stage due to problems, Squire looked amused and Bruford was wonderul in his role. That little crowd was pretty rowdy and noisy and won the band over as they did us. Wonderful memories of a past summer but an omen of the publics dwindling attention to this mighty band. They played CTTE but Kaye and Rabin went below stage for this and there were a number of miscues during the performance of that song. I don't remember where [Close To The Edge] fit into the lineup. I DO know that all the solos were ditched to make room. I was looking forward to the drum solo again, and I missed it. The performance was a bit forced. I think they eventually dropped CttE because it needed more rehearsal. For instance, Jon missed coming in on "A seasoned witch" and had to wait until the music came around again (he was visibly exhausted, staggering around the stage like a drunken man, making lots of mistakes). It was still very good, though, quite a surprise, since I had seen the Montreal show and it wasn't there. I remember that the Olympic Stadium was only about 1/3 full, and alot of people got out of their seats and crowded the stage, which Yes is not used to. People were throwing empty beer glasses (plastic) at Rabin, and Wakeman was throwing his towels at the audience. People threw their hats at Wakeman and he lined them up on his keyboards; he was certainly having fun. Anderson remarked, "You people are crazy," which got a big applause. Someone had a "Bruford Rules" sign, which I think was rather rude to White, but he was very gracious. Bruford almost knocked me down as we were leaving and he was being escorted through the crowd. Very tall guy. They didn't play "Close To The Edge" on either of the two times I saw them (One first leg, one second leg). If it was played, it wasn't done many times. Lake Placid is notable for the disappointing audience - less than 2000 I'd say. They played at the Olympic Ice Arena (small to start with) and the place was about half full (or half empty). Of note - they played three songs off the new album, recorded All Good People (I understand they did that at a lot of places), and played Close to the Edge before intermission. For Close..., Anderson, Bruford, Squire, Howe, and Wakeman were the only ones on stage. Latest word - Yes DID play Close to the Edge in Lake Placid last nite.